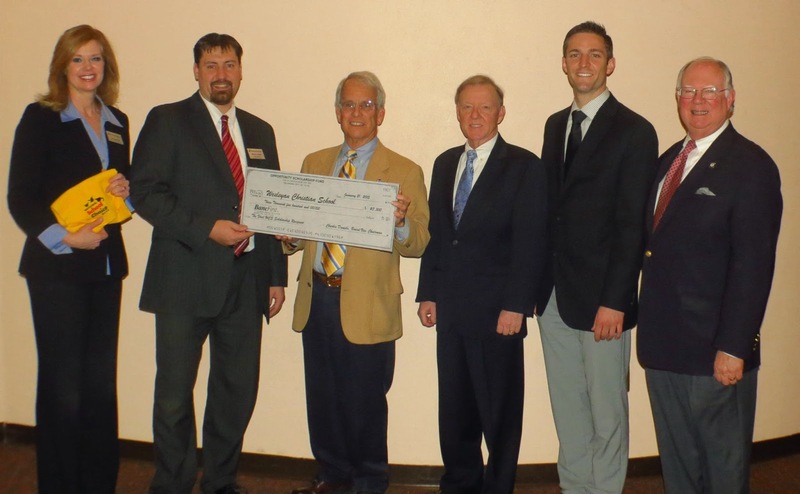 Rocky Clark, superintendent of Wesleyan Christian School in Bartlesville, receives a scholarship check from Charlie Daniels, vice president of the Opportunity Scholarship Fund, as WCS development director Jan Boomer (left), state Representatives Earl Sears and Travis Dunlap, and state Senator John Ford look on. Wesleyan Christian School in Bartlesville received a $3,500 scholarship check this week from the Opportunity Scholarship Fund (OSF). Boomer and OSF vice president Charlie Daniels expressed gratitude to state Senator John Ford and state Representative Earl Sears for supporting legislation in 2011 that enabled the creation scholarship-granting organizations like OSF.